In October I turn all my recipes into spooky Halloween fun! 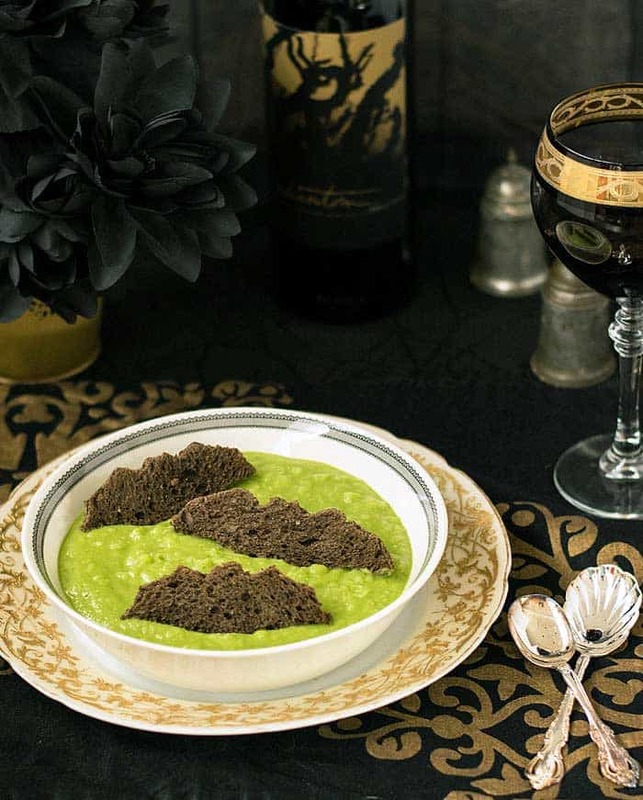 This Ghoulishly Green Vegan Potato Soup is my favorite potato soup with a twist. You could cook this soup in your slow cooker if you’d prefer. Just add the raw potatoes, water, boullion, and garlic, then cook on low for 7 to 9 hours. Right before you serve you’ll jump back into the regular directions pureeing the spinach and cashews to make it green and creamy – yum! 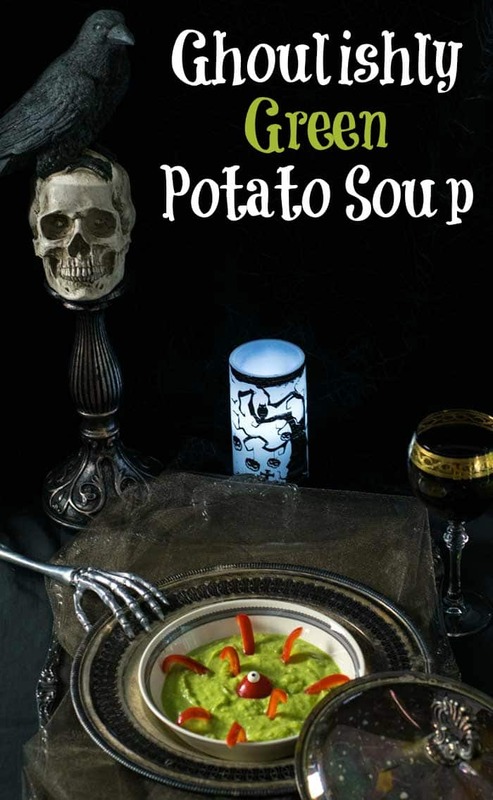 This is just one of the 25 spooky recipes you’ll find in my Halloween e-cookbook, The Ghoulish Gourmet Halloween e-Cookbook, you can get the Kindle version at Amazon for $7.95. I love potato soup, and it’s perfect for a chilly fall evening. This recipe dresses up in green for Halloween. But don’t let its “costume” trick you: it still tastes like old-fashioned potato soup! Add the potatoes, water, bouillon and garlic to a soup pot. Bring to a boil over high heat, and then turn to medium. Simmer until the potatoes are easily pierced with a fork, about 10 minutes. While the potatoes cook, preheat the oven to 350°. Cut the bread into small squares (or into Halloween shapes using cookie cutters) and spread on a baking sheet and bake for 5 to 10 minutes, until crispy. Set aside. Blend the spinach, yeast, cashews and liquid smoke with 1/2 cup of the cooking liquid. Purée until very smooth. Mash the potatoes with a potato masher while they are in the pot. It doesn’t have to be completely smooth. I like it a little chunky myself. Stir in the green mixture until completely incorporated. Serve topped with croutons. 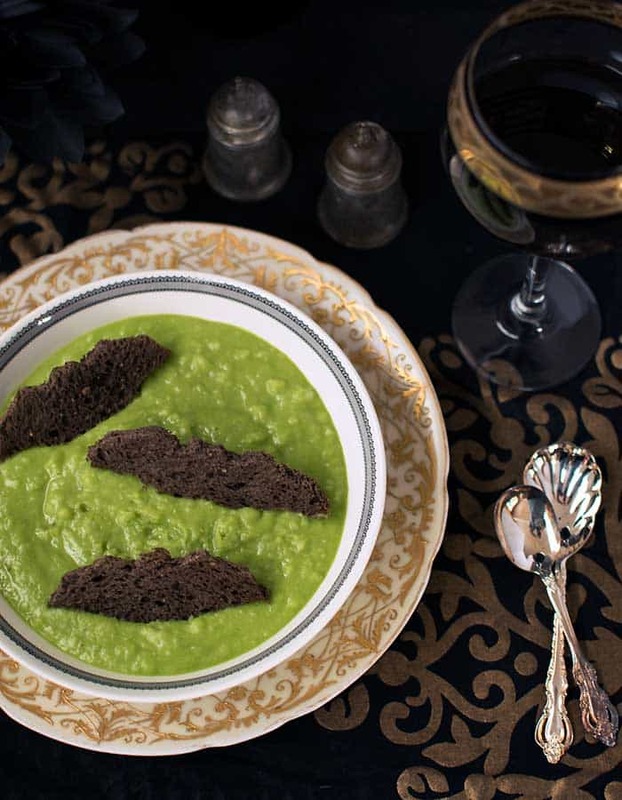 I have a thing for green soups and for Halloween! This truly looks delicious!